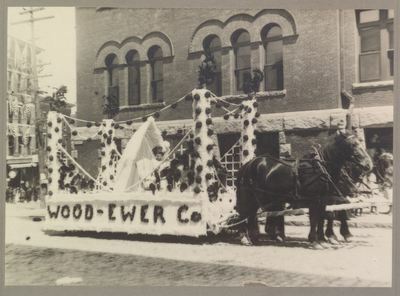 "Wood & Ewer Co. Bangor Carnival Parade Float, June 18, 1912"
"A float designed by Charles P. Wood and representing the Wood and Ewer Co. ranked well up among the best. It was done chiefly in two colors, deep red and white. On the large float were erected four large columns supported by lattice work at each side, and in the center was a canopy of pure white beneath which sat a charming young woman dressed in a dainty summer gown, and wearing one of the latest hats trimmed in deep red. Along both sides done in letters of red carnations were the words 'Wood & Ewer.' Two handsome brown horses, a pair that were conspicuous by their size, drew the float." Wood & Ewer Co. located at 9 Main Street, was served by James Burke as president and manager. Neither Wood or Ewer are identified in the 1912 Bangor city directory. Wood & Ewer sold dry goods, furs, garments, and was "for 17 years Bangor's leading garment store." Bangor Carnival 1912, Bangor Maine history, Wood & Ewer Co.